Clash of Warrior’s tenth professional event gets under way this evening. Our first professional fight of the evening gets off to a slightly cautious start for the first few seconds. Both fighters attempt a few punches and kicks but both are attempting to size up their opponent before going in for the attack. After a couple more kicks, Kieron makes his move and has Nathan pinned up against the fence. Kieron gets in a couple of punches and then manages to take Nathan down to the cage floor. 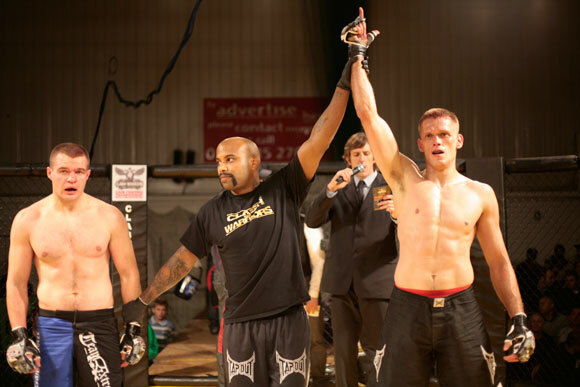 For a while the two appeared to be locked in position – although Kieron has his opponent pinned down Nathan defends himself well, and it seems to be impossible for either of them to get many punches in. Kieron bides his time and manages to manoeuvre himself into a better position. 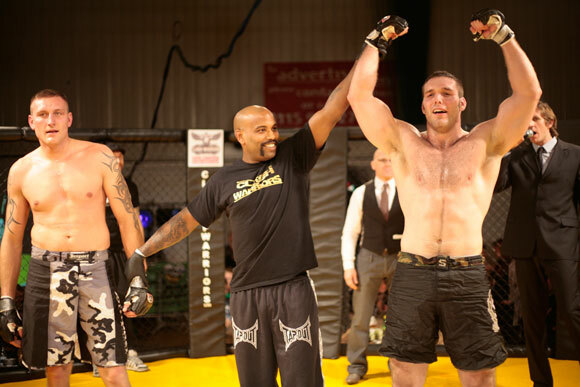 Freeing his arms allows him to deliver a barrage of punches to his opponent's head and body, which he follows by changing his approach and trying to get Nathan in a choke. However, Nathan is still defending himself well and now that the punches have stopped, he manages to reverse the position and gets top position and tries to dominate the fight. Kieron manages to take Nathan to a triangle position and tries to finish Nathan. At this point, Nathan attempts to lift Kieron off the floor and drop him down to unlock the triangle, but despite a few attempts, he is unable to break free. At this point, Kieron manages to complete the triangle lock causing Nathan to tap out. A very convincing win to kick off tonight’s event. 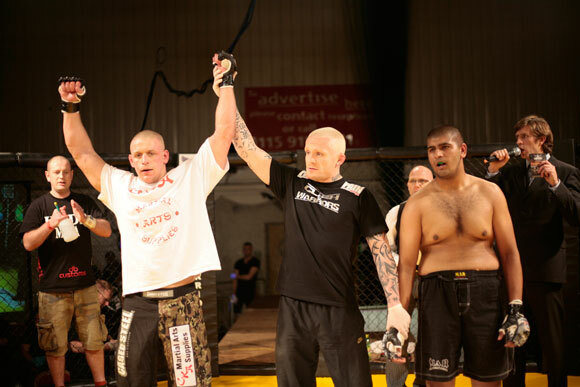 The referee for this bout was Judo Jim Wallhead. Gurdeep had brought plenty of support with him for tonight’s fight. As the fight begins, it looks like the support is working as Gurdeep lands a number of well timed punches and looks like he got off to the better start of the two. However, one of the punches is mistimed and Shaun uses this chance to go for the takedown. 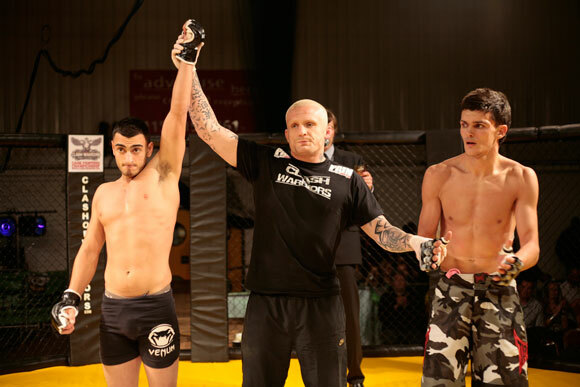 A successful takedown by Shaun results in a complete reverse of fortune for Gurdeep who ends up pinned down on the cage floor. Using that position to his advantage, Shaun proceeds to deliver a barrage of punches to the head and Gurdeep is forced to take the pounding. 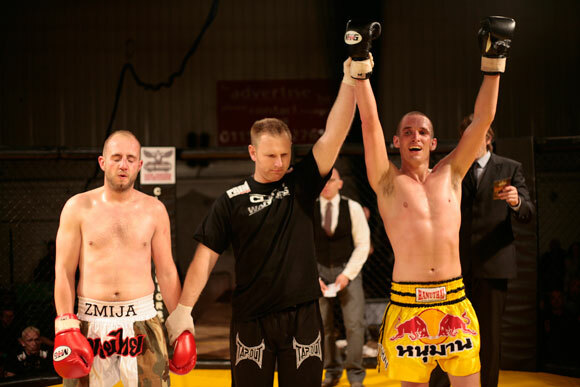 Shaun then wastes no time and moves into position to bring the fight to an end with an Arm Bar. The referee for this bout was Judo Jim Wallhead. The third fight of the evening gets under way with a Thai boxing fight. At the start of round 1 it looks like both fighters are favouring punches rather than kicks. David makes one of his punches count and sends Andy to the floor, causing the referee to step in and bring them both back to their feet. After a few more punches, this time David ends up pinned against the side of the cage. Both trying to use their knees at this point - Andy to attack and David to defend. David seems to do a better job using his knees as he has managed to turn the tables on Andy who now finds himself pinned up against the side of the cage and forced to defend. This time, the two of them seem locked together and the referee is again required to step in to keep the action flowing. Back in the middle of the cage, a similar story unfolds with both fighters going for the punches in the last few seconds of the round. A slightly different approach as round 2 gets under way with both of them using their legs to attack rather than their fists. One of David’s kicks makes contact and sends Andy to the floor. Once back on his feet, Andy responds quickly and David ends up pinned against the side of the cage once again. Andy tries to get in a few punches while he has the better position, but David once again manages to switch things round on his opponent and Andy ends up being pinned up against the cage. The two of them end up on the floor and consequently the referee brings them back to their feet. The two of them end up against the cage side as before however they seem to be locked together this time and unable to deliver many punches. End of round 2. Both fighters looking pretty even at this point. Round 3 looked similar to the first round, as both fighters reverted back to preferring punches to kicks. David manages to get Andy pinned to the fence but Andy recovers quickly and is soon back in the centre of the cage. The pace seems a little slower than the last two rounds and both fighters are looking tired. Both fighters are determined to see it through to the end, however it looks like Andy is doing more of the attacking at this point – certainly using his legs a lot more than David is. End of round 3 and it is left to the judges. The referee for this bout was Wayne Kirk. One of the quickest but also most explosive fights of the evening. At the start of the fight, both of them looked pretty even with a good number of punches and kicks coming from both Chris and Damian. Damian then springs into action and goes for the takedown. The takedown is successful and he follows it up with a massive barrage of punches and kicks. Chris can only take this kind of punishment for so long and the referee is forced to step in to prevent any serious damage. A very convincing performance from Damian. 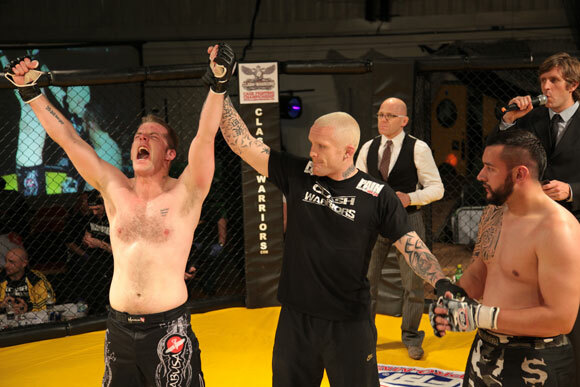 The referee for this bout was Judo Jim Wallhead. Plenty of support for local fighter Carl Booth as tonight’s fifth fight begins. A cautious start by both Carl and Mike at first as both fighters wait to see what the other does. Carl makes the first real move with a good kick followed by an even better punch which sends Mike to the floor. Carl jumps at this chance and delivers a barrage of punches to the head. Mike deserves credit as he seems to be taking the beating but seems unable to launch any sort of attack. His determination looks like it may pay off after a while as he manages to get back to his feet. However, Carl soon pins Mike against the side of the cage. Carl continues to dominate the fight pounding Mike on the floor until the referee steps in and brings the fight to a close. 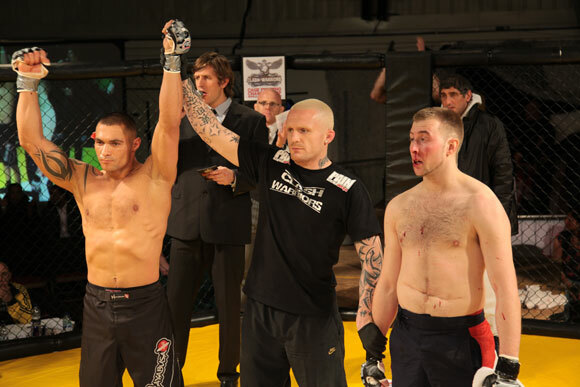 The referee for this fight was Judo Jim Wallhead. This is a rematch between these two fighters and within seconds of round one beginning, Johnny has Dan pinned against the side of the cage. Johnny gets his arms around Dan’s neck making it almost impossible for him to dictate any part of the fight. Down on the floor of the cage the two fighters seem to be locked in this position, however thanks to some skilful defending, Dan eventually manages to get himself on top of his opponent and delivers a barrage of punches. Johnny takes the punishment and although he manages to get Dan in his full guard, both he and Dan remain in this position making it difficult for either to make any headway. Each tries to make the most of a punch when they can, but they remained in this position until the end of the round. Round two begins, and the pair of them both manage to get a few early kicks in. Dan goes for an early takedown but Johnny defends it well and he manages to end up on top. Johnny uses this position to deliver a number of punches, though Dan does a good job from the bottom position and delivers a few punches. Following the punches, the two fighters become inactive and the referee has to step in to ensure the action keeps going. Back on their feet, Dan goes for the takedown again and is much more successful this time. He moves into position to go for the choke and Johnny has no choice but to tap out. 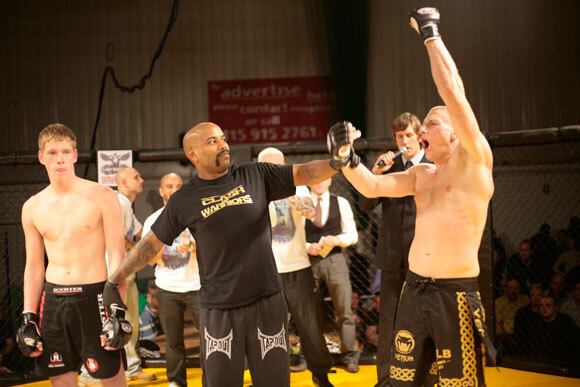 The referee for this bout was Judo Jim Wallhead. 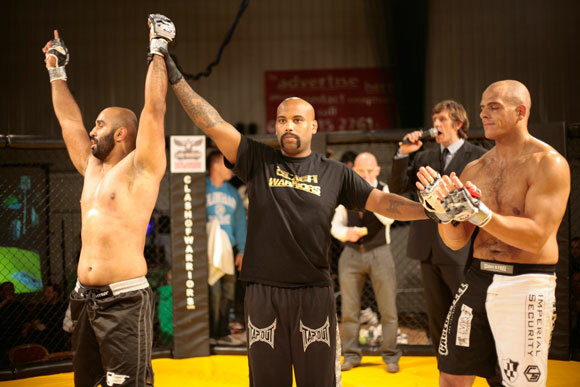 It was impossible to hear tonight’s MC Alistair Weir over the roar from the crowd when Subiag Singh entered the cage. Subaig always brings plenty of followers to his fights and this evening was no different. A slightly cautious start at first, but Subaig landed a couple of good punches and kicks making Edvardas look unsteady on his feet. Subaig lands another good punch to the face and seizes upon this opportunity by pinning Edvardas down on the cage floor before delivering a further barrage of punches. The blood can be seen clearly on his face however in a remarkable turn of events, Edvardas manages to regain control of the situation and has Subaig pinned down on the floor in a headlock. Although he seems to have the advantage, it is difficult for Edvardas to capitalise on it as he is putting all his energy into keeping Subaig where he is. The two are essentially dragging each other around the cage as Subaig tries to get into a better position and Edvardas tries to stop him. Eventually, Subaig’s perseverance pays off and he manoeuvres into a better position which allows him to land some punches on Edvardas’s face. 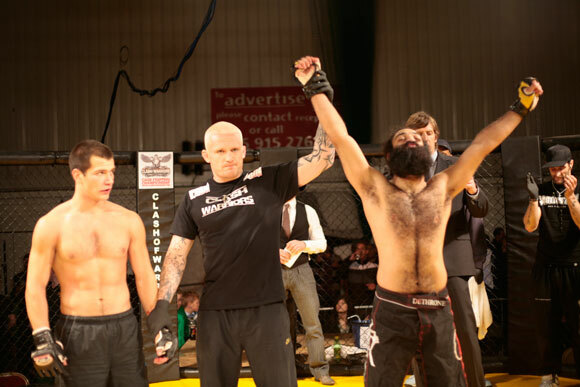 With Edvardas reeling, Subaig moves round and goes for a rear naked choke. The referee for this bout was Judo Jim Wallhead. A few early punches from both as fight eight gets underway. Chris manages to get Tomas pinned up against the fence and he eventually manages to pick his opponent off the ground and brutally drop him on his back. Chris makes the most of being on top and delivers a number of punches to the head whilst Tomas is trapped on the cage floor. Despite taking a number of punches to the head, Tomas manages to get himself out of the pinned down position and turn the tables on Chris. However, he cannot quite get into the position he needs and the two of them seem locked together for quite some time. Tomas manages to get a few punches in but not to the degree that Chris managed earlier. End of round one. In the second round, Tomas gets off to a good start by getting a number of good punches in early on. Rather than trying to punch back, Chris tries a different tactic and goes straight for the takedown. He succeeds in getting Tomas pinned up against the side of the cage. Tomas tries to get back to his feet but Chris is determined and Tomas ends up back on the cage floor. Chris decides to go for a few more punches but Tomas does an admirable job taking the punishment. Chris then moves into position and brings the fight to an end with kimora. The referee for this bout was Judo Jim Wallhead. There was the usual huge amount of support for Marios as he stepped into the cage. The fight begins with the fighters kicking but none of the kicks were making contact. Omar misjudges one of his high kicks and ends up on the floor. Marios wastes no time reacting to this and tries to go in to finish the fight early, however Omar defends brilliantly and the pair of them are quickly back on their feet. After a short period in the middle of the cage, Omar misjudges one of his kicks again and the two of them are both on the cage floor. This time they appear to be locked together in the guard for a while. Despite a number of attempts on both sides, neither fighter is able to get any punches in that will do any damage. Marios struggles to keep Omar pinned in the position he wants him and Omar successfully manages to get into a controlling position behind Marios and goes for the choke. A debut that we’re sure Omar will be pleased with. The referee for this bout was Dean "The Renegade" Amasinger. Blink and you may have missed this fight. As soon as the round begins, Craig starts with a number of kicks and a particularly powerful one sends Tadas to the cage floor. Craig follows this with a ferocious barrage of punches and the referee has to bring the fight to an end. The referee for this bout was Dean "The Renegade" Amasinger. The fight starts with Aurelijus and Eddie striking each other. Eddie proceeds to go for a takedown and manages to get the position he wants. It looks like Eddie is trying to make the most of the position he is in and going for a choke but Aurelijus is protecting himself well and makes it impossible for Eddie to do as he wanted. The two of them are locked together in this position for quite some time with very little action happening in terms of punches or knees. Eddie manages to get into a more advantageous position and delivers a few punches to the head just before the end of the first round. A similar start to round two, although noticeably a lot more punches from Aurelijus now than in the first round. After an initial outburst of punches, both fighters are on the cage floor. However they both defend their positions very well and neither can maintain their position on top for long. After a while of the two fighters trading places within the locked-in position they are both on their feet again for a while. A couple more punches from both results in the two of them once again been locked together on the cage floor. Not much action in this round as each of them is making it difficult for the other to throw many punches. As round three begins, both fighters make a few attempts at a takedown but neither can get the timing quite right. Instead, both have better luck with punches – both fighters manage to make contact with a few good shots. Eddie perseveres with his attempts at a takedown and eventually succeeds. He manages to get Aurelijus pinned down but maintaining this position means he is unable to get any punches in. Eddie changes tactic, moves into a better position and brings the fight to an end with an Arm Bar. 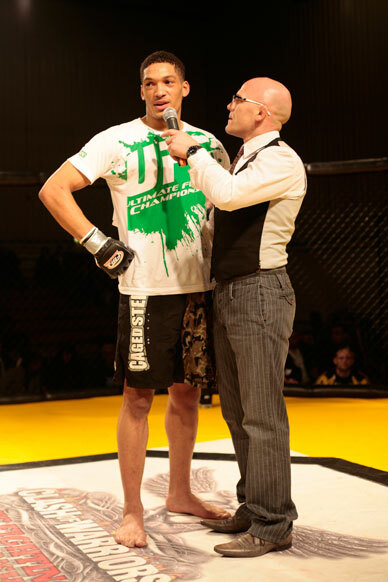 The referee for this bout was Dean "The Renegade" Amasinger.